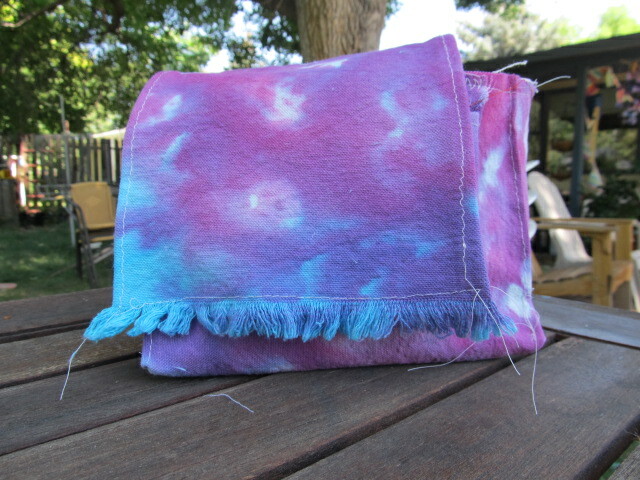 To aid in the Girl’s quest to wear non-matching socks, I suggested tie dye- she wanted to turn it into a party, but I have control issues- We have done tie dye parties before, and they aren’t that much fun for me. We kept it small- a tee shirt, an 8 pack of socks, and some muslin scraps to play with- they’ll be quilt pieces, or gift bags, or whatever. I had a bunch of semi circles left from our angel costume experience, so I figured we’d dye them and play with them. I also have a biggish piece of white canvas that I wanted to dye to make a summer purse. Yes, I know what month it is. It’s just that I have misplaced the summer purse that I got at the zoo last year (seriously, has anyone seen it? you know, batik, in kind of blues and greens, with a Chinese coin clasp?) and I’ve been carrying an olive drab one that is just the right size, but kind of ugly. But I digress. I used corn syrup as a resist to make squiggles on the canvas. I saw instructions in the last issue of Cloth Paper Scissors. Or maybe Quilting Arts magazine- I have a hard time keeping them straight. The shirt and socks we just rubber banded the usual way. We bought a kit, which comes with bottles and gloves and instructions, for about 10 dollars. 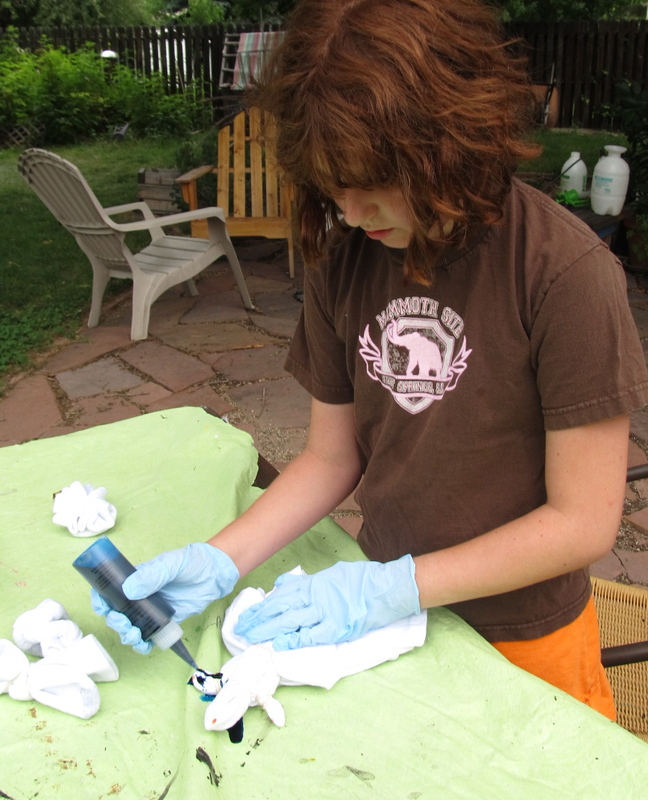 We set up the plastic tablecloth on the back porch, mixed up the dye according to instructions and went crazy. Actually, the Girl went crazy, and I went all control-freaky on her. “are you sure you want to mix all three colors? You have to go easy on the… now it’s just…don’t squeeze so hard…would you just…” And then it started to rain. She went inside. You can see the splotchy socks, but otherwise, it's a pile of success. The results? 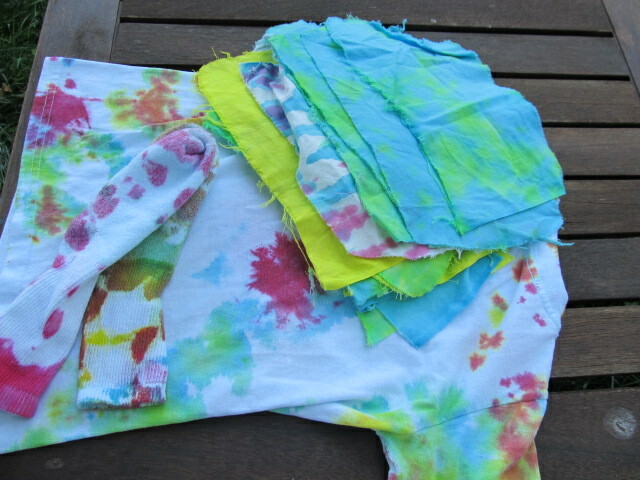 The muslin scraps are really cool- I’m thinking of something with wonky log cabin? There’s not enough for a quilt, maybe a pillow cover, or gift bag? For the uninitiated, a log cabin pattern is a traditional quilt pattern with narrow rectangles surrounding a small square. A wonky log cabin is when none of the angles are 90 degrees, so each block is kind of crooked. The Girl’s shirt has a few brown patches, but is otherwise cool. The socks aren’t great- they are a cotton spandex blend, and didn’t soak up the dye very well. My favorite piece is the canvas, though- the corn syrup formed an incomplete resist- some color went through, so there are light patches, rather than pure white. I got up the nerve to cut it up to make a new summer purse. Yes, I knowwhat month it is! But just think, I have until next summer to finish it. I just need some d-rings and webbing for a strap, and we're good to go.